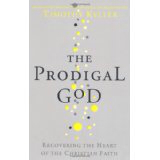 This Sunday we start a new series, based on the book The Prodigal God by Tim Keller. It takes a fresh look at the story, commonly known as the prodigal son or the lost son, which Jesus tells in Luke 15. I'd encourage you to read the whole of Luke 15 in preparation for Sunday, and ponder for a few moments on the three stories Jesus tells there about lost things. I'd also encourage people to buy a copy of the book and read it. We've got copies in the bookshop and it's also available on Kindle. What makes this series so exciting for me is that what comes out of the story relates so clearly to the peach and coconut ideas you'll have heard me talk about if you've been around Kerith for any length of time. On that note the first draft of the book (imaginatively titled The Peach and the Coconut!) which I've been writing went off to an external editor this week. The hope is that we'll have it printed ready to give out for the second Sunday in September. All quite scary but also sort of exciting! Hope you're having a great week, and hope to catch you on Sunday.